In December of 2010 a court settlement granted the Navajo Nation increased access to and usage of water from the San Juan River. This was the culmination of a long history of legal battles but there is still very strong tension between local agriculture and the Navajo People over water rights and usage. Former Senator Jon Kyl (R-Ariz.) introduced SB 2019, the Navajo-Hopi Little Colorado River Water Rights Settlement Agreement and Act of 2012, in February of that year. Senator John McCain (R-Ariz.) was the bill’s only cosponsor. Under this settlement, the Navajo Nation would be required to permanently waive their aboriginal (as in first priority) rights to the Little Colorado River (LCR) watershed in exchange for promises from Congress for two water delivery projects serving two (out of 110) communities. Additionally, the Nation wanted a comprehensive rather than piecemeal deal and this Settlement was not comprehensive. It lacked many components the Dineh people asked for. This settlement also would have supported the ongoing environmental injustices caused by the coal economy on Navajo Nation. More specifically, it would have made water delivery to Navajo and Hopi communities contingent upon the renewal of various leases – for transmission lines, coal and water supplies – for the Navajo Generating Station through 2044. Another issue is that the settlement did not actually quantify Navajo water rights to the LCR and did not allow for fair compensation for Navajo water from the LCR. Upstream users were allocated and guaranteed specific amounts of water, even in times of drought, and the Navajo Nation was not. Lastly, the process to approve the settlement completely excluded the Navajo people and their actual needs for water. It was introduced in a press release from Senator Kyl’s office before it was even introduced to the Navajo Tribal Council and the dense language was never explained to the Navajo People. The Navajo People organized, educated themselves, and convinced their leaders to vote no. This will continue to be an issue but for now the bill is dead [www.ncrp.org]. Project Details Dine’ community members have raised concerns that Northeastern Arizona Indian Water Rights Settlement Agreement (NAIWRSA) gives the Navajo Nation only 31,000 acre-feet per year of 4th Priority Colorado River water, which would not be available in times of drought, and would require more than $500 million of new federal funding to pay for pipeline infrastructure to deliver water to communities in need. 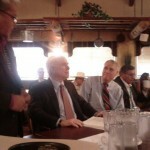 The federal funding would have to be appropriated by U.S. Congress (http://www.poormagazine.org/node/3324) and historical relations between U.S. government and Dineh Navajo have not seen much fruit. Total Navajo domestic water use is approximately 12,000 acre-feet annually. Forty percent of the Navajo Nation households haul water for domestic use. Navajo per capita water use on the reservation ranges from 10 gallons per day for water haulers to 100 gallons per day for those living in larger communities and have running water. Most non-Navajo communities in the region use more than 200 gallons per day. Approximately 20,000 acres of small Navajo farms use approximately 100,000 acre-feet of water annually. This acreage does not include historically irrigated lands. The Navajo Indian Irrigation Project irrigates approximately 60,000 acres and diverts approximately 206,000 acre-feet per year. When completed, it will irrigate 110,630 acres of land and divert 508,000 acre-feet per year. The estimated 300,000 permitted animal units obtain water from approximately 900 windmills and 7,000 stock ponds across the Navajo Nation. Industrial and mining water use in the region is approximately 75,000 acre-feet per year. In Black Mesa, Arizona, the Peabody Coal Company uses approximately 4,500 acre-feet annually. Development of Alternatives Former Navajo Nation Chairman Peter MacDonald suggested that Navajos should control and undertake the study of the aquifer themselves and this includes paying for it. He stated that Navajo should not only do a study, but develop the well and own it. Thirdly, he argues that the Navajo Nation must control the usage and allocation of that C-aquifer (the specific aquifer where they get their water from). Why? Explain briefly. The Navajo Nation has endured a long history of environmental injustice with corporations and government agencies continually desecrating their rights. In 2013, the Navajo received a court victory that assured them of their water rights. It is hard to be sure that this will result in subsequent action in line with this law. Only time will tell. 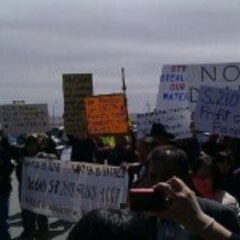 Some say the decision will be appealed (http://www.daily-times.com/ci_23896295/navajo-water-rights-settlement-approved-aztec-district-court).